This FREE TOOL Will Double Comments On Your Blog In 2016! →This FREE TOOL Will Double Comments On Your Blog In 2016! The year 2015 is almost completely gone. Time to strategize for the new year, 2016. I know most of us will sit and make wishes but those who take action are the winners! Blog commenting is an exciting exercise. It makes your blog a living community. Sometimes, when you hit the publish button and no one ever comes to drop a comment, it feels like you didn’t talk to somebody. When readers drop comments, it means they recognize your work. It means someone’s in the house to converse with you. It means a lot to me. That’s why I thank the thousands of you who have been actively commenting on my blog in 2015. One thing that everyone (including you) likes is appreciation. When you appreciate someone who does a good thing, you cause him to do more. That’s just the nature of man and I think God for making it so. As a blog owner, there are many ways to say Thank You to your comment authors and encourage them to keep coming back to your blog. I created this completely free plugin so you can easily add more value to your blog while making your readers know they are being recognized. You can now create a blog post and publish the list, thanking your comment authors for being on your blog during that month. Once the list is published, you will be able to send a mail to everyone that commented, telling them about the Thank You blog post. That keeps them coming back to your blog for more engagement. I recommend you try this out on your blog in 2016. The plugin is simple to use and the results are always very positive. What you need is create a Thank You blog post once a month. 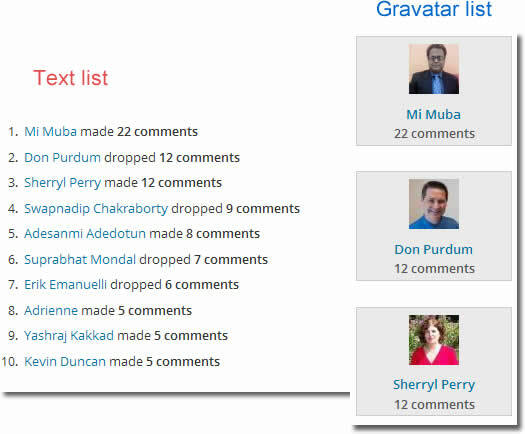 Generate the list of those who dropped comments on your blog during the month. Copy the HTML (generated by the plugin) and paste on your new blog post. The plugin allows you to send a Thank You mail (Including a link to the Thank You blog post) from within its settings page. (But do this with caution). How To Double Traffic This EoM! Guaranteed!! -> Download the plugin here! Here is the list of my comment authors in the month of November 2015 and I’m saying a big thank you to my readers who took the time to drop a valuable comment that got approved. I dropped 22 awesome comments. Hi, My name is Areesha Noor. I made 21 awesome comments. Hi, My name is James Lenfers. I made 19 awesome comments. Hi, My name is Rahul Dubey. Hello, My name is Amit Rockz. Hi, My name is Nicole Pary. I made 12 awesome comments. I dropped 12 awesome comments. Hi, My name is MINHAJ UDDIN. I made 10 awesome comments. Hello, My name is Kurt Kummerer. Hi, My name is Suprabhat. Hello, My name is Hannah Edia. Hello, My name is M.Mairaj. Hello, My name is Tim Soulo. Hello, My name is Nguyễn Văn Hợi. Hi, My name is Shamsudeen. Hi, My name is Dan Ewah. Hi, My name is Gina Horkey. Hello, My name is Al Mamun. Hello, My name is Isabel Raynaud. Hello, My name is MS Qureshi. Hi, My name is Baibhav. Hello, My name is Naman Kumar. Hi, My name is Moo Jae. Hello, My name is Tanvir. Hello, My name is Don Purdum. Hello, My name is Brenda Pace. Hello, My name is Jerry Everett. Hello, My name is Neena. Hi, My name is Jerry Low. Hi, My name is anwar. Hello, My name is Rahim. Hello, My name is Alisha. Hello, My name is Alia. Hello, My name is Philip V Ariel. Hello, My name is Bosstechy. Hello, My name is rahul samant. Hi, My name is Amit. Hi, My name is Abayomi. Hello, My name is Mabel. Hello, My name is Lawrence. Hello, My name is Erika Mohssen – Beyk. Hi, My name is Akash Navi. Hello, My name is Irene Anum. Hi, My name is Sue Anne Dunlevie. Hello, My name is Wilfried. Hi, My name is Anil Reddy. Hello, My name is Rohit Singh. Hello, My name is Tola Korede. Hi, My name is Justin Rutkowski. Hello, My name is David Gen.
Hello, My name is Zara. Hi, My name is Jack Seen. Hi, My name is Utsav. Hello, My name is chotu. Hello, My name is Reshma Patel. Hi, My name is Kanayo. Hello, My name is Akaahan Terungwa. Hello, My name is Akshat. Hello, My name is Tunde Sanusi (Tuham). Hello, My name is Pallab Kayal. Hello, My name is Saksham. Hello, My name is Nick Carter. Hello, My name is Sita Gabriel. Hello, My name is raman kundal. Hello, My name is Andrew Larder. Hi, My name is Vikram. Hi, My name is saransh. Hello, My name is Bjork. Hi, My name is Chetan Gupta. Hello, My name is Sani. Hi, My name is Sean Gillum. Hi, My name is SHIJIL S.
Hello, My name is Mathew Arts. Hi, My name is Atinder. Hello, My name is Ahmad Rasheed. Hi, My name is IMNabeel. Hi, My name is Abhishek Butola. Hi, My name is Pulkit Trivedi. Hi, My name is Yvonne I. Wilson. Hello, My name is Theresa. Hi, My name is Rachit. Hello, My name is Vishal. Hello, My name is Jerry Hart. Hello, My name is Ted. Hello, My name is Stella S.
Hello, My name is anoref. Hi, My name is Nyle Levi. Hi, My name is Soumen Siddhanta. Hi, My name is MRH Abu. Hi, My name is fakhar. Hello, My name is Luke Wallace. Hi, My name is Rajesh Jhamb. Hi, My name is Nitin. Hello, My name is Ron Benson. Hello, My name is I. C. Daniel. Hi, My name is Sagar. Hello, My name is Ayodeji Onibalusi. Hi, My name is Korex. Hello, My name is Arsh. Hello, My name is Efoghor Joseph Ezie. Hello, My name is Mazino Oyolo Kigho. Hello, My name is oguama lilian ogechi. Hi, My name is Ahmed Magdy. Hello, My name is Torsten Mueller. Hi, My name is Edi Dominic. Hello, My name is Avtar singh. Hello, My name is Dumisami. Hi, My name is malihakhan. Hello, My name is Adewunmi. Hello, My name is Sherryl Perry. Hi, My name is Bridget Wright. Hi, My name is Chitrapathi. Hello, My name is Barbara. W.
Hello, My name is Ritesh. Hello, My name is Jewel Rahman. Hello, My name is MMairaj. Hello, My name is misty mishra. Hello, My name is Barry. Hi, My name is Rizu. Hello, My name is webjacky. While I hope to interact with you again this December 2015, I know the year 2016 has more packaged for us. Do you have MyCommentAuthors? Drop a comment below and let me know what you think about it. Kindly share the post with your friends on social media so they too can know about this plugin. Great little plugin! Really cool to give thanks to all your awesome commenters. I have not had a chance to check it out, but will definitely give it a try at some point. You should add a feature that tells you who had the most comments for the year! You could also do a contest based off the number of comments people leave. Once you add this plugin to your wp blog, it will insert a widget on your dashboard showing the most active commentators on your blog. I think this is since your blog went live. I have done commenting contests on this blog before based but used something else to count and select winners. A friend (http://blogverve.com/) however has used this plugin to pick top commentators for a prize so I think anyone can just do it without any further coding. Do you however have any specific idea? Wowsy Dec 1st! Where did 2015 go? Yeppers as you have stated time to start strategizing for the new year, 2016 which is right around the corner HUH? I do have your plugin on my blog but I have not used it to the full potential that it has. I am going to add this to my 2016 list of goals. Crazy Not To! Right? Well Happy December and Thanks For The Mention My Friend! Glad to see more comments. How did black friday and cyber monday went ?As planned, made over 23 sales. I do have the plugin but it is not activated. Lets end this year with great note!! How are you planning other events ahead? Thanks man. I really appreciate you stopping by again today and engaging. Thanks for the mention. I’m happy to be here. Thanks for being around. You will be mentioned again in the next report. I think it’s a great plugin to build up engagement. Glad that i found my name on your list. Thanks for introducing this great tool. Thanks for being part of this blog in November. By leaving this comment, you just entered the list I’ll publish in January 2016. I don’t know that you have created this type of plugin which creates a post automatically to publish on our blog, I have seen this type of posts in money gossips website by Suprabhat Mondal, I think it is the best way to thank our commenters by showing their images on our blog post. I will try this plugin very soon on my blog, at present my blog comments reduced a lot because recently I started concentrating more on building content with less interaction with fellow bloggers, thanks for sharing this information, see you soon with another article. Wow, that is a pretty cool plugin you made there. I made 19 comments in November, and probably in a week or two. I don’t know whether to be happy, thanking you, or apologizing to you though. Maybe a combination of all 3 and a fruit basket for Christmas. I stopped using this plugin while I got so busy offline. Now I think it’s worth my attention. When I was actively using it, I used to have over 600 comments a month. It’s really a comment booster. Are you planning to use it? Yes, I do believe I will use the plugin. I would definitely like more real comments on my blog. I know my post are pretty heavy reading and for those that do and leave a solid comment I think they definitely deserve the appreciation. Not that I don’t get dozens of comments a day. Robots selling sandals out of china. More robots selling sunglasses in Russia. More selling Pharmaceuticals out of Canada. I look at this like, oh, the glass is a little bit full there. Those spam robots just bloody love me. LOL. My finger is wearing out from hitting the spam and permanently delete button. So for those that actually come and read the post and its a real comment, you bet I would love to recognize them. Hahah those spammers are stupid, really. I always ask myself if they ever get good results. Well, maybe they do. That’s why they keep spamming. I was in a rather rare mood over the weekend and I took two of those robot spammers that hit me allot, completely edited out their links, edited all that flattering umm, crap, they put in, so the comment actually reflected the post they were spamming. Tracked down the owners of the websites, took out their false names, put in the real name, thanked them very much for such a sincere and well thought out comment. Of course I have gone back to just hitting the spam and delete button on them. Two times satisfied my need for retribution. Yes, sometimes my sense of humor can get a little strange. How To Turn Your Spam To Jam! I use a different top comment widget but I’m going to try this because it has larger thumbnails. Using such a widget not only encourages comments but rewards those who engage with your blog. What a wonderful thing to see you here and thanks for the engagement. Apart from having a Top Comment Widget, MyCommentAuthors allows you to generate the list of commentators for a specific month in html format. You will then paste the html tag in a blog post to create a list similar to that above. I must say its an awesome tool, going to use it on my blogs soon. The best thing I liked about this method is we get genuine comments and also loyal readers. I started using this plugin on my another blog where I talk about blogging and internet marketing. I can say there is 30% boost in the comment. Barry recently posted…Do You Really Need to Use Antivirus on Android? I’ve seen this plugin in action before! It’s really neat. Didn’t realize you created it. I might need to use it after my re-branding. I remember one time I was recognized on your site for publishing the greatest number of comments in a month. And you’re right — it made me want to comment even more! Yeah I created it from scratch and I’m working to add some features. Those days back when I was actively using the plugin, I used to have 600+ monthly comments. Of course, the traffic too was more important. I believe people get more active if they are appreciated. Enstine Muki recently posted…Beautiful WordPress Themes ~ 2016 Rock Solid Designs! You always come with new post ideas and that’s why l always love to visit your blog on regularly. Seriously! I completely agree with you that blog commenting is a good practice. I know one of the blog commenting superstar Adrienne! I like him 😀 Blog commenting is a good way to build good relationship with like minded bloggers. That’s why i have a good blog list for doing blog comment regularly. Anyway, thanks a lot for sharing this good plugin with us. I am going to try MyCommentAuthors great plugin on my blog soon! Thanks to blog commenting, we are networked and there are better days ahead for us. Adrienne is a wonderful person. She’s got a lot of testimonials proving she shares a lot of love. Keep reading her blog. It’s much pleasure to hear your sweet words always! Really, i believe that blog commenting can help us to build good network to do something better in our blogging journey. I always try to learn something new every moment and try to share my knowledge with others! Anyway, i will definitely inform you whenever i get installed this plugin on my blog. Actually, i am now busy with working inside to my website. Hope i will let you know soon! Realy cool plug to start the new coming year. I would suggest to add click that shows all the commentator’s comments. Now shared on my twitter net. I have noted your suggestion and will work on it. Well thank you for mentioning my post, I appreciate that. Wanted to be sure and thank you before I forget. I remember when you released this plugin and everyone jumped on it. I wasn’t one of them as you know because I like to take a different approach when it comes to commenting. I don’t want people commenting for the sake of being #1 on this particular list. Granted, I know that reaching out and thanking them for commenting can be very beneficial for you so that you’ll stay on their minds but there are so many auto generated messages and things these days that they’ve lost their meaning. At least to me, I ignore them all I’m afraid. For those just starting out though and wanting to get more attention I’m sure it could be in their benefit to at least take this one for a test run and see if it will help them not only with getting more commenters but more interaction as well. As always I wish you the very best with anything you’ve created because I know the reasoning’s behind them all and you’re just a really great guy Enstine. Always eager to help bloggers, we are very blessed to have you. Keep up the excellent work and I’m excited to see what you’ll be bringing us in 2016. You enjoy your week okay! Thank you for coming by and reading that post and commenting on my mine by the way. There really is a difference on those that have nowhere really to go but up, ummm, “me”, for instance, and those that are already heavy targets for comment spam. And I don’t mean just the robotic type which is a pain, but easily managed. I mean those coming to your site for the pure purposes of nothing but trying to link build. They will not tend to target a low PR site. Just the robots will, since they will target everything and everybody they can. When you hit a certain level and you hit that level, then you start hitting list as places to link off of. Which in itself wouldn’t be such a bad thing, except it gets used by people that want to use, without helping others. Black hat list for instance. But up your link profile while you destroy others is what it kind of what the end result comes down to. So I understand what your saying when you say, “for the right reasons”. Yes, I see those list you are all over, where allot of major traffic sources are from, how its effecting your sites stats. Where you are becoming incredibly popular, at least at getting user hits over all of this. That is why I like Enstine allot also. It is not a one way street. He is trying to help bloggers. And yah, hes a nice guy. And he can come along and toss a comment and link on my site any day because of it. I don’t have to sit there and wonder at all, ummm, was this for the right reason. Like anything else online there will be those who are here for the right reasons and those for the wrong. Then you have those who want quick results and they do the wrong things to get them which ends up hurting everyone involved pretty much. We all want to help those that want our help but we each just have to be smart about it too. I LOVE blog commenting, it’s what put me on the map but I quickly learned how beneficial it could truly be and my hope is that others will see this too. Enstine is a great guy, I’m so glad I met him through blogging as well and he’s only here for the good. I so admire what he does and I stand behind him 100% whether I use what he has or not. I know they’re for the right reasons. Thanks James and you have an awesome day. Oh, I agree 100 percent. I just had a young man show up and I really wanted to help him. But first, he obviously didn’t read the post at all. “Great post!” Follow by 3 paragraphs all about his site. Then redirect inside the post content going to his site via some ID account. A redirect, that lands at the exact same place as the main url listed in the website address. Okay, I take out the redirect. Then I go to the comment section off the comment luv link and I find he has just switched over to Disqus. Grrr, okay, he is an author of books, not a blogger about blogging, so I let that pass. I went ahead and approved the comment. Then I took a second look and what do I see except the exact same comment he had made on my post was a copy and paste he had made one of Enstines. Back we go to the spam button. I don’t want to discourage people. I do want to help them. But seriously, they are looking the Golden Goose right in the face on people that want to help them and spamming them, which is just going to spread it around, hey, great and easy place to spam it up, and it ultimately kills the goose. I would have been happy to have added this young man directly to a author directory page which would have been a whole lot more powerful then a comment link anyhow. All it would have taken was 5 to 10 minutes of time, a real comment instead of one he is pasting around and he would have had a whole lot more powerful and permanent link. Sad, some very good otherwise people with many possibly even having great content on top of it, and trying to link build with bad methods. This kid was one of them. I liked his work. I liked his site. Then he just had to try to play me for a dumb little comment section link. And there are several pages on my site, just ask for a site review and probably get a very unique and permanent referring domain. Why is this so hard? So let me tell you one of the reasons I LOVE CommentLuv Premium. Had that young man landed on my blog then what I would have done was send him an email straight from his comment telling him why his comment was not being approved. I point them to my Commenting Rules and low and behold, where he went wrong will be listed. I’ve actually had a lot of people email me back apologizing and that’s when the conversations start and they get a quick lesson about commenting. For those people who aren’t bloggers like you said, they don’t know any better and I have a feeling someone has given them some horrible advice down the road. Thanks for the rich comment and powerful words of encouragement. I have read your blog and known you and what you stand for. You have also created a wonderful loyal community and your members (including me) are always there to drop those comments not for any reward. Some folks still think they can spam the comment section on blogs and move away with a bucket of goodies. That’s absolutely wrong except they want to throw their spam messages on some spam blogs. Whatever they do, serious bloggers will always get them. BTW, thanks for the interaction with James. I appreciate Adrienne interacting also. I need to get over to her blog and read a couple of post she linked on mine that look rather interesting. As to comment luv, if you notice, I almost always take the comment luv link out and I don’t repeat a link. That is basically called, respecting your site in advance. I realize the free version, which is what I use does not have the option of setting so many comments first, so its going to toss them in. If I don’t want them, then it is of course up to me to upgrade, or pull them out. And I do pull them out, since it is even in the back of my mind, this is somebody I trust, have some kind of relationship, that is not just link dropping. I have to do it manually where the premium, I could just set it. Have I seen them 3 times before or have a relationship? Even on them, there really is no need for redundant linking in the same post. The free version tosses it in. On replies, same link, I take it out. I like the plugin. It works great, has a enormous amount of work poured into it and Andy deserves his due. Frankly though, so does Michael Tolbert at SEO All In One that my site absolutely could not live without and been operating off of since about day 3. There is something of a pecking order that doesn’t amount to cheap. It amounts to what you can afford to do in what order that is the most important and what has to be done for best effect versus what you would like to do for optimization on top of it. I think you would probably agree if we made a list and said okay, now from top down, what do I need to do? I need to protect my domain name, so I need every major extension of it. I need solid WordPress Hosting. I need some SEO software plugin that handles the parts that would be a absolute nightmare to try to manage without it. I probably a premium grade theme that is allot more Google friendly, loads faster and doesn’t cause those nasty errors Google see’s and makes your site look far more professional. I probably need some good on page optimization plugin or its not going to rank and to optimize the content for other scores Google finds as very important, readability for one. And then if you want to improve your comment sections on top of all of this, network better, there comes comment luv and the other things, like gasp, built into the premium version. Now, what has to be figured out, is what is this list of importance on what you want to effect the most first, and in the case of comment luv, I figured since I am using it on others peoples sites, the least I could do is give them the capacity to use it on mine. That was a issue of fairness to them, not out of wanting to draw more commentators as the primary reason. If I linked on them, and they clicked on it and came to mine, well, I wanted them to be able to link off mine. Comment Luv comes into the need to do list, but it doesn’t sit on top, yet. I actually plan on fixing this in a way where the ability to do this needs to be done list can just be done. The next major thing is actually investors I already have lined up to Incorporate the blog and all the properties of it. I have to basically sell off a piece of it in stock, but it solves the money problem, allows me to put everything in place it needs to be totally professional and optimized, with the exception of my own content I still need to write. So comment luv premium is definitely on the to do list, just not at the top of it. I know Andy would probably rather live off money for his work instead of site support that it exist and I believe it is very good. That is kind of hard to spend, those support credits. But they actually are real and far more beneficial then those that like it, even recommend it, but stopped using it with a list of reasons why. At least people do see it one more place and might think, oh, this could be good for me too. You know I don’t like the direction comment sections are going. I only wrote 5007 words about it. But like Adrienne likes to say. We can’t control what others do. Just what we do and how we respond to what others do. What a joy to read this note again! Today I noticed one more option of this wonderful plugin, i mean the drag and keep it on the sidebar option. Thanks for explain it again, I am sure as you said it will double your comments!! I can add this Plugin in my website Widgets aswell? Thanks for being faithful with this plugin despite some issues on your blog. Now, I really don’t know why commentluv fails for your blog. As you can see, for others, it works. I don’t know if it’s an issue related to your own blog. I usually don’t use it, but I found a similar issue where it won’t take, but when I really want it to, I uncheck the box and then if I want to add a comment luv link, I recheck the box and it picks them up again. I don’t know if that made any sense at all. If its not working right, like in Philips case, uncheck the box, type out the whole comment, then recheck the box and it runs through the RSS feed again and you can pick your link. The box is currently unchecked, the comment is finished, now I will check the box and pick my last post. Possibly, as a after thought that might be the issue. It seems to be gathering off RSS so if it totally isn’t functioning for someone, it could be on their end with the RSS set to totally off. Wow, I am in the list. I will visit this web everytime and comment. And this website is so nice. I randomly visit on your blog and found each post a very helpful as a mini eGuide for other bloggers and today after reading this post I must say that there is still lots of things which I have to learn from you. Yes, this is a cool and very helpful plugin to engage more with your bloggers with the help of commenting. Thanks for sharing this with all. Okay, I got it installed and am looking it over. Oh look, there is Adrienne. Hehe, I like it. I think plugin is pretty cool. I know all bloggers get a bit attached to their own words. In my case I think anyone that will take the time to read the treatise I write and leave a good comment about it probably deserves case and prizes. I have no problem giving them a link and a mention. Thanks Enstine, I will give it a little 5 star too when I figure out where to do that. I am working on that 5 star review. I have to go make a WordPress org account. But its coming, just like Christmas, its coming. Next thing I am going to do after I take a break from writing a 2,000 reply to a young blogger showing up from here that wanted advice on directories that they are monsters. Yes, they are monsters, and not easy to slay the good ones anymore and avoid the bad ones. LOL, I wonder if he wanted that much help though. Got that account and review done. Oh, I used the wrong email address though on setting it up, so it didn’t grab my gravatar image. Oh well, its still there. You wanted 1 star right? 1 star is best, kind of like a Ace is better then a 5 in blackjack, right? I actually like this thing. Read the review and I think I spell it out. Comment sections are splitting in two directions pretty much. And I view them like content in a way. They really need to be great, but great takes allot of work, just like great content does. Then the question comes, do people want to do the work? Some may not feel its worth it. I personally feel it very much is. Nice Plugin, When I started this blog, I don’t know that which plugin are you used? After getting sometimes and bolt letters show ‘MyCommentAuthors’ and further used this plugin. Another impressive article or enjoyed to reading this article. First of all thanks for adding my name in this list and I am so happy that I do 21 comment and you gave me dofollow backlink because I am on 2nd position. Thanks Enstine for giving me honor. The plugin is flexible so you can set the limit to give a dofollow backlink. It seems to be a powerful plugin. I will follow your advice and experience in my project to see the result, then I’ll say what was the result. I have to say that you really been doing your due diligence with the updates. It was a great idea to come up with this plugin and I have been using it every month. Has it been boosting my comments? I went from getting about 30 comments a post to 40 within a year and it’s still growing . The last few posts has averaged between 50 and 60 comments which is great. I look forward to 2016 and I think it’s a great idea to add a blog post thanking my commenters for their participation. I remember when I just created this plugin, I used to have over 600 comments a month. That figure dropped when I stopped publishing this report. I think it does well to increase the number of comments. Give it a try and let’s see how it affects your stats in 2016. You’ve developed wonderful plugin and most importantly you giving it for free, that’s amazing. I am going to install in on my blog toady, hopefully it will work for me as well. could you update and let me know how it goes? The online part of that work came as a direct result of a connection I made through YOUR website recommendation, so a huge thanks for that. I already have MyCommentAuthors and it certainly did make a huge difference to my blog traffic, so again….. Thanks! That’s another of the things that’s been keeping me busy, because I’ve been building a team website to help get sign-ups for my people. It’s a bit out of my comfort zone for me and a bigger project than I’d imagined, especially when I’m over-committed anyway. But just taking it steadily and doing a little bit whenever I get chance. Glad to hear you’re keeping busy too. Am pretty new to blogging recently started and this is going to be my first comment on your Blog. Seems like their’s much to read from previous blog post. The Plugin seems to be a Awesome addon what I will be looking at after getting my site a little bit more exposure as a new blog it’s just started. Hope the plugin will be updated regularly won’t get abandoned. Back to you, Am still new to learn a lot of blogging stuff. Thanks for making the first comment here. I’m sure you’ll find a lot of good stuffs here on this blog. Just hang around and don’t fail to jump into my list for blog updates. Yes, be sure to grab the plugin. I’m sure it will do well to boost your engagement too. I don’t know about this kind of tools, after reading this post to get more information and further used to this plugin as well. Who will forget the awesome comment plugin that does wonder and builds relationship plus engagement. I only wish it could work with Disqus comment. It would much more cool. Wow…what an experience I’ve had today. I’m an ancient Aussie marketer who is relatively new to the blogging scene and discovering your blog today has been a real eye opener. Blog commenting took on a whole new meaning for me once I had absorbed and understood what bloggers like Adrienne Smith (and you of course) freely share to newbies like me. I must tell you that the time I spend blog commenting has significantly increased once I also realized just how much you can also learn from the comments of others. Truth time: It was only 5 months ago that my understanding of blog commenting was simply to drive traffic – boy I sure did get this completely upside down! The mindset I have now for my blog commenting has nothing to do with traffic but everything to do with reputation and simply enjoying the process. As a newbie I think giving my best possible blog comments will, over time, build my blogging reputation and my blog community and that’s what it’s all about. Thank you for the complimentary plugin. I’m showing my inexperience here but I assume it will work in conjuction with the CommentLuv premuim plugin I already use on my blog. Your first engagement here was on 2015/09/23 when you dropped a comment on Kurt’s featured posts and I’m excited to see you back. Blog commenting is a wonderful working method for starters to quickly grow their blogs. Once you’ve identified some active blogs in your niche, being active on them will surely pay back. Though the traffic as reward is exciting, networking and building reputation are more on the positive site. If you drop comments like this one, there is no one you can go unnoticed. Yes MyCommentAuthors works great with commentluv premium. Give it a try and let’s feel it. Hey Enstine I had forgotten all about my comment on Kurt’s post so I am very impressed with your recall systems mate. Thank you again – I have already installed your plugin and really looking forward to giving it a whirl. I must tell you I really appreciated you making the time in your hectic schedule to visit with me on my blog – you just made my day! will use this to get more comments. Wow, You have developed great plugin. It is most valuable plugin for free which is wonderful. Hope it will work better and get famous. This is a very interesting plugin and a nice way to reach out to people that have taken the time to comment. However, the platform that I use for my blog does not allow the installation of plugins so I cannot give it a spin. Thanks for stopping by to share a word. You are going to be present on my next report again so thanks again for being part of the community. I will surely try this plugin as it will help me boost number of Comments on my Blog. Great plugin, Currently I’m using this plugin on my blog it is really working very well thank you for sharing this post …….